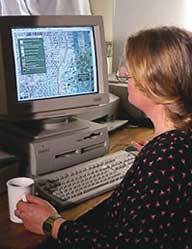 Electronic maps allow people to explore an area and make comments at computer terminals with specially created software. They have immense potential for helping people to visualise proposals and make their views known. Electronic maps are created as software which can be run on desk-top computers or touch screen monitors. Aerial photography, maps, video clips, sounds, photos and 3-dimensional visualisations can all be incorporated to build up a series of images of an area from a variety of perspectives. People can explore the map at computer terminals in libraries, cafes and cultural centres and add their own comments. The maps can be continually adapted to provide an ongoing information service and consultation process. Hastings, UK 1999, Greenhalf Photography. Finding out what is going on in your neighbourhood and making your views known at a computer terminal. Great potential for linking up with maps in different areas and for accessing via the Internet. Gathering the content for maps is itself a part of the exploration and participation process. Developing software from scratch could cost as much as US$80,000. But it should soon be possible to purchase software under license for a few hundred pounds. Then cost is reduced to gathering the raw material for your map. This could cost around US$15,000 or much less if you use material already available. Based on a custom geo-location database engine with SQL interface. Scaleable and modular design allows limitless adaptation and infinite extension of map area. Performs on low spec machines due to low memory overheads with no more than 1.5MB on screen at any time. Works on ordinary desk-top machines, both mac and pc formats. Start with an aerial photo on screen. Use cursor keys to move about and to zoom in to the place you are interested in. Superimpose maps on the aerial photo or view them separately. Maps might include: regeneration initiatives (as shown), cultural facilities, proposed new buildings. See live action through video clips. This might include presentations, art works, interviews with people (as shown), street scenes, performances. Click on a place you want to view and it fills the screen. It may be a photograph, drawing, photomontage or model of how it could be. Click arrows to move about. See and hear what other people think. Add your own comment by typing or speaking.